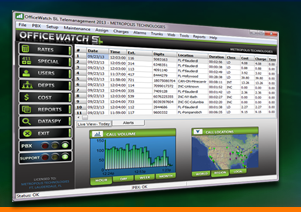 OfficeWatch Call Reporting provides visibility for businesses to easily track all calls within the organization to determine employee productivity and prevent against unauthorized phone usage. The application includes an automatic report scheduler which configures an unlimited number of reports to be emailed, printed or archived on an hourly, daily, weekly, or monthly basis. Toll fraud, trunk analysis and 911 alerts help businesses gain ROI from their investment. OfficeWatch Call Accounting Reviews Recently Reviewed! Pros: Love the dashboard - it helps our businesses track daily call volume,and review employee productivity. It has a relatively easy report builder feature - set up the reports to be sent at definite hours. Breakdown per unit, department or company as a whole. Useful visual reporting with integrated maps. Outstanding technical support department. Cons: Nothing that I can think about. Had no issue with this product. Overall: The on-boarding process was very in detail and their technicians explained all in detail: how to set up the software, building and customizing the reports, etc. Officewatch is a very easy to use call accounting software which supports a range of voice systems. Pros: Installation is very easy writing no time the software starts collecting data of your voice system. Generating reports in a few seconds and with the ability to setup monitors the connection with the voice system. Cons: The web based reporting seems to have a few issues when generating reports that contain a lot of data. Overall: Get an overview and manage costs on your voice system. Comments: For years we were stymied by products which were expensive, awkward to install and cumbersome to support. Office Watch is the only call accounting product we offer to our customers. Simply put, it works. Installs easily, has an easy to use intuitive user interface and requires minimal support over time.